These films combine stellar filmmaking, beautiful cinematography and first-rate storytelling to inform, inspire and ignite solutions and possibilities to restore the earth and human communities while creating a positive future. This year’s film festival selections will not only take audiences to some of the most remote and beautiful places on the planet, but introduce them to the magnificent animals that inhabit these places and the courageous individuals who are working to protect and preserve both for future generations. Weekend Film Festival Passholders are invited to kick off the Film Festival Friday night in Wynola at Jeremy’s on the Hill with a special “farm-to-table” event featuring food from local organic farms. Hors d’oeuvres by celebrity Chef Jeremy Manley (who also started Julian’s farm-to-school lunch program), plus a no host bar will be available throughout the evening. The event will feature a short film on the farm-to-table movement, and a talk by Tricia Elisara, who started Julian Elementary School’s garden, on the positive effects of kids eating food they have grown and harvested. Some of the filmmakers will also be on hand during the soirée. Space at the dinner is limited to 50 people. Purchase your Weekend Festival passes. Saturday’s 24 stellar films, many with numerous awards, will begin at 10:30 a.m. and continue throughout the day in four 75 to 105-minute sessions with a 90 minute break for lunch. The festival will also include Q&A sessions with some of the filmmakers. Grab a sandwich from Candied Apple which will be sold at the High School venue and then scurry next door to the Library to catch an amazing lunch-time talk by Mimi Hughes, school teacher from Tennessee and author of the book “Wider Than a Mile,” which chronicles her historic 1,770-mile swim down the Danube River in 87 days, in order to create awareness of environmental issues facing our rivers and our planet. Walk back to the High School because you won't want to miss the award-winning film, Xmas Without China, a humorous look at how one American family accepts the challenge of living a month without the ubiquitous “Made In China” label on anything they purchase or use in their home. The film was the brainchild of Chinese immigrant Tom Xia, who moved to the United States as a boy and wanted to explore the material relationship between his new home and his native one. He unfolds an improbable relationship between two families living side by side but worlds apart. Tom, his parents, and the director of the film, Alicia Dwyer, will be available for questions after the film. 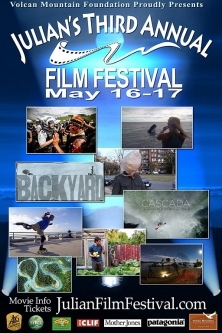 The film festival will wrap up on Saturday night at Town Hall with an awards ceremony and party. For the first time, the festival will be giving awards, designed by the world-renowned local Julian artist James Hubbell, for People’s Choice, Best Documentary, Best Short and others so come and vote for your favorite films! Beer and wine from local boutique breweries and wineries, as well as a buffet dinner from Granny's Kitchen and various desserts, will be available for sale as you enjoy the music of Grand Canyon Sundown.